CULVER CITY, Calif., Oct. 24, 2017 /PRNewswire/ -- Get ready to "deck the halls" as digital broadcast network getTV prepares to debut its first original offering, "A Nashville Christmas," a 60-minute music-variety special featuring popular country artists Wynonna, Emmylou Harris, Lorrie Morgan, Pam Tillis, Ashley Cleveland and Dailey & Vincent, on Thursday, December 7 at 8PM ET/7C. The special is one of the highlights of getTV's third annual "Most Wonderful Month of the Year" celebration. Jeff Meier, General Manager and SVP, Programming for getTV said, "At getTV, the fan response to our broadcasts of classic holiday specials from Andy Williams, Perry Como, Johnny Cash and more has been overwhelming, so it just made sense that our very first original production would follow in this great tradition of holiday music specials for the whole family. We're thrilled to be able to bring these wonderfully talented country performers together for 'A Nashville Christmas.'" 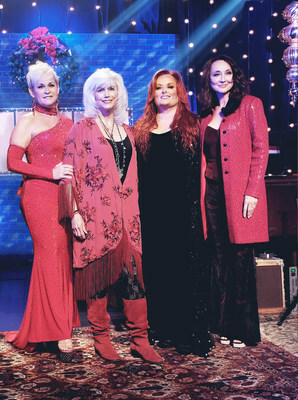 Among the show's highlights are Wynonna's solo performance of "O Holy Night"; Emmylou's "Coat of Many Colors"; Wynonna and Emmylou's first ever duet "Beautiful Star of Bethlehem"; Lorrie's rendition of "The Christmas Song"; and Pam's "Santa Claus Baby." Wynonna first rose to fame in the 1980s alongside her mother Naomi in the country music duo The Judds before beginning her solo career in 1991. Since then, she has released eight studio albums, a live album, a holiday album, and two compilation albums in addition to more than 20 singles. She has two Billboard Awards, an Academy of Country Music Award and four nominations in total, four Grammy Award nominations, four Country Music Association nominations, and an American Music Award nomination. Following her successful 2016 Christmas tour with her band The Big Noise, Wynonna released her music video for "Keeps Me Alive," her first in 14 years, this past June. Emmylou Harris recorded her first album in 1969 and has released many popular albums and singles over the course of her career; a 13-time Grammy winner, she was inducted into the Country Music Hall of Fame in 1988. One of her most memorable recordings is a Christmas album, Light of the Stable, released in 1979, with its title track featuring backing vocals by Dolly Parton, Linda Ronstadt and Neil Young, along with such holiday classics as "Silent Night", "O Little Town of Bethlehem" and "The First Noel." Lorrie Morgan, daughter of country music singer George Morgan, charted her first single in 1978 and has since had more than 25 singles on the Billboard Hot Country Singles & Tracks charts; with more than 15 studio albums under her belt, Lorrie has sold over 6 million records worldwide. In a career spanning almost 40 years, Pam Tillis, whose father is country music singer Mel Tillis, has released 17 albums, including 2007's Just in Time for Christmas, as well as 36 singles. Pam has won a Grammy Award, a Country Music Association Award, two Recorded Event of the Year Awards from the International Bluegrass Music Association and was inducted into the Grand Ole Opry in 2000. In 2013, Lorrie and Pam teamed for a duet album, Dos Divas, and have a new album of duets, Come See Me & Come Lonely, releasing in early November. Ashley Cleveland is a three-time Grammy and two-time Dove Award winner who has released eight critically acclaimed albums. Her 2009 album God Don't Never Change, was nominated for a 2010 Grammy Award for Best Traditional Gospel Album, and her memoir, Little Black Sheep, was published in 2013. Three-time Grammy nominees Dailey & Vincent, with four Dove Awards, 35 IBMA Awards (including three for Entertainer of the Year and three for All-Time Vocal Group of the Year) and five individual Grammys, garnered worldwide attention with their weekly national television series "The Dailey & Vincent Show" on RFD TV, which is currently in production for its second season. Other highlights of getTV's third annual "Most Wonderful Month of the Year" celebration include the TV movies "The Secret of Giving," starring Reba McEntire, premiering Thanksgiving evening, Thursday, November 23rd at 8PM ET/7 C; "Yes Virginia, There is a Santa Claus," starring Richard Thomas, Charles Bronson and Ed Asner, premiering Sunday, November 26 at 8PM ET/7C; and "Christmas on Division Street," starring Fred Savage and Hume Cronyn, premiering Monday, December 4 at 8PM ET/7 C; and the variety specials "Johnny Cash Christmas 1983," featuring guest stars Merle Haggard and Ricky Skaggs, premiering Thursday, December 7 at 9PM ET/8 C (following "A Nashville Christmas"); and "Vanessa Williams and Friends: Christmas in New York," with guest stars Shania Twain, Phil Collins, Luther Vandross and Babyface, premiering Tuesday, November 28 at 8PM ET/7C. A complete schedule of getTV's "Most Wonderful Month of the Year" special programming, including additional airings of "A Nashville Christmas," will be available at a later date on www.get.tv. Anchored by Sony Pictures Entertainment's vast TV and film library, getTV is a national TV network dedicated to your favorite movies and TV series. getTV features action, crime, vintage comedy and western TV series along with classic motion pictures from all eras. For information, visit get.tv and connect with the network on Facebook and Twitter @getTV.